When looking for kitchenware and accessories that really make the grade, there are many things to consider: durability, functionality and of course, their aesthetic appeal (after all, you want your home to look great as well, don’t you?). Academy Home Goods do all of these things and more. Their range of kitchenware draws upon classic form and utilitarian function while also keeping up with trends and using a variety of materials, such as glass, marble and metals. Made from wood with marble sides. 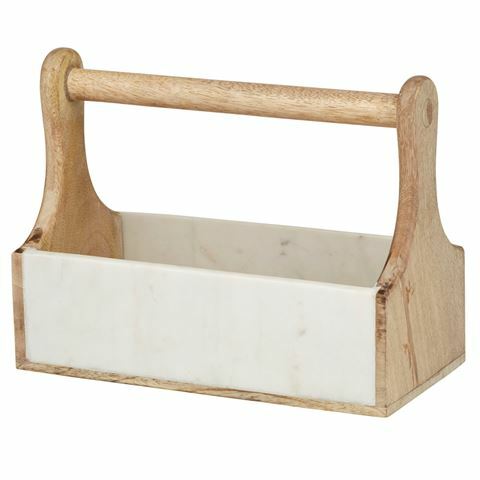 Ideal for cutlery, tumblers, small herb pots and much more! Wipe clean with a damp cloth if required. Dimensions: 28cm (l) x 15.5cm (w) x 21cm (h).